Kell Brook introduced himself to American fight fans with a classy fifth-round stoppage of Puerto Rican tough guy Luis Galarza. welterweight world titles and wanted to make a statement on his American debut in Atlantic City. He got the job done at the Boardwalk Hall, taking occasional early shots before stamping his authority on proceedings and forcing the stoppage. The win took Brook to 26-0 with 18 stoppages while Galarza dropped to 17-3 (13 KO wins). Brook tested the water in the opening moments - taking a strong right over the top for his trouble - but soon assumed control by the end of the session and had Galarza stunned briefly as a left hook hurt his opponent and a right - a split second after the bell - scrambled the Puerto Rican's senses. A powerful left showed Galarza's own power in the second. Brook soon jumped in with a right hand before picking his shots brilliantly to hurt his man again. Perfectly timed left hooks were dominating the fight for the classy Yorkshireman and when he planted his feet to let the power shots go, Galarza was in deep water. 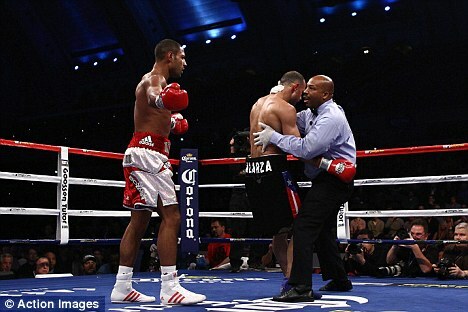 Referee Allan Huggins was watching closely, seemingly ready to step in and end Galarza's misery as the sparse crowd enjoyed Brook's work. But Galarza, though cut around the right eye and swollen in several other places, survived into the fourth. Brook was prepared to bide his time before stepping it up in the fifth. A stiff right hand shook Galarza and after taking a step back, Brook followed it up with a left hook and sharp right combination which had Galarza out on his feet and prompted Huggins to step in after one minute and 38 seconds of the round.